It’s hard to know which workout program is best for you. There are an endless number of voices and new fad programs claiming to giving you everything you’re looking for. So we’ve read through hundreds of studies to give you a scientific workout program. Low intensity: Prolonged time spend sitting has been associated with increased mortality risks, independent of exercise levels. Taking short low-intensity activity breaks from sitting has been show to counteract many of these negative outcomes. One study had participants sit down for either 7 hours straight or stand up and take a 2 minute walking break every 20 minutes. Those who broke up the sitting time had reversed the negative effects of sitting. Additionally, low intensity exercise has been found to produce the most positive effects on mood. Low intensity activities include standing, walking slowly, and doing most household chores. The more low intensity exercise you get the better. Moderate intensity: All of the health benefits of exercise listed above can be attained through 150 minutes of moderate intensity exercise a week (except colon cancer, breast cancer, and substantial weight loss). With 300+ minutes a week you gain the added colon cancer, breast cancer and increased likelihood of weight loss benefits. Moderate intensity activities include walking fast, doubles tennis, and biking slowly. The more moderate intensity exercise you get the better. Vigorous intensity: As a general rule, an individual needs 1 minute of vigorous intensity exercise to gain the same health benefits of 2 minute of moderate intensity exercise. Vigorous activity has been shown to improve aerobic fitness better than moderate intensity activity as measured by VO2max. Vigorous activity also appears to reduce the risk of cardiovascular disease, body fat and all-cause mortality to a greater degree than moderate activity, after controlling for total energy expended. Vigorous activities include jogging, swimming, singles tennis and biking fast. Unlike light and moderate exercise, you can get too much vigorous exercise though. The benefits of vigorous exercise flattens out at roughly 50 minutes a day. More recent research shows that people who run 25 miles a week or more, actually are barely better off than those who don’t run at all. 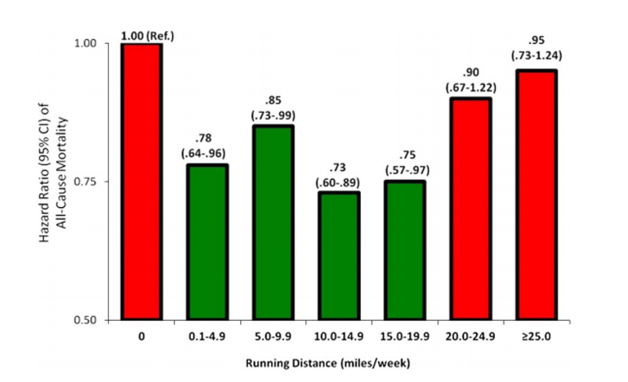 The best outcomes came to those who ran 10 to 15 miles a week. 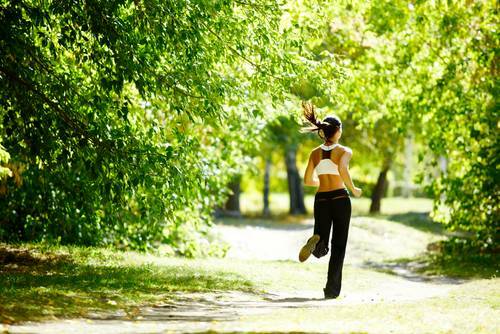 Furthermore, researchers found that running 2 -5 days a week at about a 8:30 minute/ mile pace is ideal. So too much vigorous exercise can actually be counterproductive. Putting it together: Engage in vigorous exercise 2-5 days a week. Get as much light and moderate activity a day as is reasonable (read more). Progressive overload: The most important concept in strength training is progressive overload. It states that more stress needs to progressively be placed on muscles for them to continue to adapt. This is often accomplished by adding weight to each exercise as you get stronger. Exercise order: Even with sufficient rest, performance typically declines over the course of a workout. For that reason higher intensity, multi-joint exercises like the squat and bench press are typically performed early in a workout. You also may want to perform any new exercises (that you’re trying to learn) or exercises targeting an especially weak muscle early in the workout. Short exercise bouts: Exercising in 10 minute bouts has been shown to be as effective as exercising in longer continuous bouts. It wouldn’t be a bad idea to understand what catabolism (https://askmuscle.com/catabolism/) is. It’ll help you shape your workout to get the best results for you. Spread out to at least 3 days a week: Individuals who exercised in longer bouts on 1-2 days a week had a lower mortality risk relative to inactive individuals. 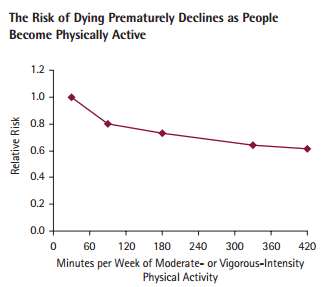 However, the overall mortality risk was lowest for individuals who spread their exercise out over at least 3 days a week. Behm, David G., and Anis Chaouachi. “A review of the acute effects of static and dynamic stretching on performance.” European journal of applied physiology 111.11 (2011): 2633-2651. Bishop, David. “Warm up II.” Sports Medicine 33.7 (2003): 483-498. Dunstan, David W., et al. “Breaking up prolonged sitting reduces postprandial glucose and insulin responses.” Diabetes care 35.5 (2012): 976-983. Fradkin, Andrea J., Tsharni R. Zazryn, and James M. Smoliga. “Effects of warming-up on physical performance: a systematic review with meta-analysis.”The Journal of Strength & Conditioning Research 24.1 (2010): 140-148. Healy, Genevieve N., et al. “Breaks in sedentary time beneficial associations with metabolic risk.” Diabetes care 31.4 (2008): 661-666. Lee, I-Min, et al. “The “weekend warrior” and risk of mortality.” American Journal of Epidemiology 160.7 (2004): 636-641. O’Donovan, Gary, et al. “The ABC of Physical Activity for Health: a consensus statement from the British Association of Sport and Exercise Sciences.”Journal of sports sciences 28.6 (2010): 573-591. O’Keefe, James H., and Carl J. Lavie. “Run for your life… at a comfortable speed and not too far.” Heart 99.8 (2013): 516-519. Patel, Alpa V., et al. “Leisure time spent sitting in relation to total mortality in a prospective cohort of US adults.” American journal of epidemiology 172.4 (2010): 419-429. Peterson, Mark D., Matthew R. Rhea, and Brent A. Alvar. “Maximizing strength development in athletes: a meta-analysis to determine the dose-response relationship.” The Journal of Strength & Conditioning Research 18.2 (2004): 377-382. Pollock, Michael L., et al. “Resistance exercise in individuals with and without cardiovascular disease benefits, rationale, safety, and prescription an advisory from the committee on exercise, rehabilitation, and prevention, council on clinical cardiology, American Heart Association.” Circulation 101.7 (2000): 828-833. Reed, Justy, and Sarah Buck. “The effect of regular aerobic exercise on positive-activated affect: A meta-analysis.” Psychology of Sport and Exercise10.6 (2009): 581-594. Rhea, Matthew R., et al. “A meta-analysis to determine the dose response for strength development.” Medicine and science in sports and exercise 35.3 (2003): 456-464. Robbins, Daniel W., et al. “Physical performance and electromyographic responses to an acute bout of paired set strength training versus traditional strength training.” The Journal of Strength & Conditioning Research 24.5 (2010): 1237-1245. Swain, David P., and Barry A. Franklin. “Comparison of cardioprotective benefits of vigorous versus moderate intensity aerobic exercise.” The American journal of cardiology 97.1 (2006): 141-147. Swain, David P. “Moderate or vigorous intensity exercise: which is better for improving aerobic fitness?.” Preventive cardiology 8.1 (2005): 55-58. Tremblay, Angelo, et al. “Effect of intensity of physical activity on body fatness and fat distribution.” The American journal of clinical nutrition 51.2 (1990): 153-157. Wen, Chi Pang, et al. 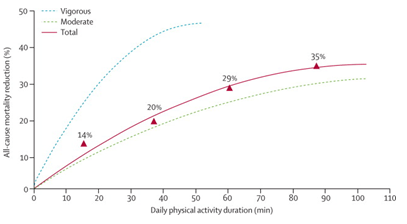 “Minimum amount of physical activity for reduced mortality and extended life expectancy: a prospective cohort study.” The Lancet 378.9798 (2011): 1244-1253. How Much Happier Would You Be If You Had Won the Lottery?